We have a charity shop in the centre of Blackpool. We sell good quality clothing and other goods at realistic prices. 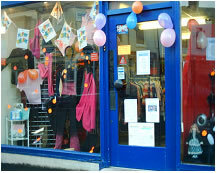 We are able to take donations of clothing, shoes, bags,belts,childrens toys, jigsaws and bric a brac. These items can be delivered to the shop during opening hours. We also accept torn, damaged shoes and clothing that we can recycle so feel free to drop them off. If you are interested in volunteering at the shop please contact John Gildert on 07710 984481.